312 pages | 2 B/W Illus. This book explores the emergence, and in Poland, Hungary, and Russia the coming to power, of politicians and political parties rejecting the consensus around market reforms, democratization, and rule of law that has characterized moves toward an "open society" from the 1990s. It discusses how over the last decade these political actors, together with various think tanks, intellectual circles, and religious actors, have increasingly presented themselves as "conservatives," and outlines how these actors are developing a new local brand of conservatism as a full-fledged ideology that counters the perceived liberal overemphasis on individual rights and freedom, and differs from the ideology of the established, present-day conservative parties of Western Europe. 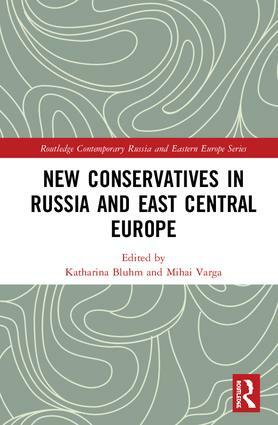 Overall, the book argues that the "renaissance of conservatism" in these countries represents variations on a new, illiberal conservatism that aims to re-establish a strong state sovereignty defining and pursuing a national path of development. Katharina Bluhm is Professor of Sociology at the Freie Universität, Berlin. Mihai Varga is Senior Researcher and Lecturer at the Institute for East European Studies at the Freie Universität, Berlin.